Not done! You can’t take two of Bollywood’s superstars together for the first time and then make a film that confounds your senses, boggles your mind and tries your patience. 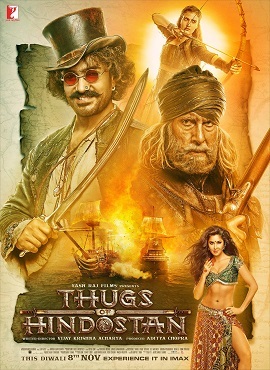 Thugs Of Hindostan does all of this, and more. It is guilty of many crimes, not the least of them being the rather strange attempt to pass off the corny as the epic, and the dishevelled as the spectacular. The plot, we are told, is based on an ancient novel by Philip Meadows Taylor which no one seems to have read. There is something pronouncedly hollow about the plot, as it brings forward two larger-than-life heroes, a wizened buccaneer Khuda Baksh Azad and a colourful con-man Firangi Malla .The latter’s scene-hogging moneky-tricks will annoy you to a breaking point. Firangi Malla could serve well in police torture.He confuses us about which side he owes his allegiance to, the British or the native. Firangi, himself, I suspect, doesn’t know which way his loyalty goes. He is joined in this carnival of confusion by others in the cast who dance bellow and snarl in a clueless mob,indicating some kind of ferocious pledge out to get the British Colonists out of our country. The British are gone. But they seem to have left behind a legacy of hate-filled films that show them to be utterly stupid. From Manmohan Desai’s Toofan to this the latest attempt to downsize and ridicule the Goras, makes us wonder how they managed to rule us for centuries when they were so stupid. Stupidity, however, is not the crux of this film’s vacuousness. Dullness is. The more noise, colour and computer graphics director Vijay Acharya adds to the bristling broth, the more desperate the film appears to qualify as an epic. All attempts to infuse the goings-in with gallons of glory remain in the domain of the vain.The plot is a mish-mash of pulpy patriotism and tawdry swash-buckling. The ships are not the only visible entities at sea.After a point, the writer-director seems to have just given up on the logistics of his purported spectacle, as scene after scene of fireballs exploding midair weave in and out of the plot in a smoky haze of absurdity and implausibility. Besides the fact that Aamir Khan plays his over-the-top character with a hammy relish, the film’s other major failing is its pedestrian periodicity. There is no sincere attempt to create an 18th century aura during the British Raj. This failing is most evident in Katrina Kaif’s styling. As Suraiyya the seductress with a permanent nose-ring, who comes on screen only when she is required to contort her curvaceous body to a tantalizing tempo, Katrina must ask herself one vital question after she finishes asking what on earth she’s doing in this film: did Surraiya have Manish Malhotra to style her chic look? By the time Manish’s Suraiyya starts wriggling and sizzling in front of the (Gora) villains while the hero stands enchained, I was thinking of Laxmi Chaya singing Maar diya jay ke Chhod diya jaye in the 1970s’ hit Mera Gaon Mera Desh. Not one to be left out, Fatima Sana Shaikh bursts into a lullabye there and then in the middle of Kaif’s drizzle of sizzle, reminding us that sleep is perhaps one escape from this over-decorated, underwhelming chamber of periodicity. Shaikh gets a lot of footage. I wonder why! She can’t emote properly and all the dancing has gone to the curvaceous Ms Kaif. The one performance that towers above all else is that of Mr. Bachchan. Silently seething for wrongs done, he was the character I most identified with. Believe me, no atrocity committed by the Britishers can match what The Thugs have done to us. 15 queries in 1.257 seconds.